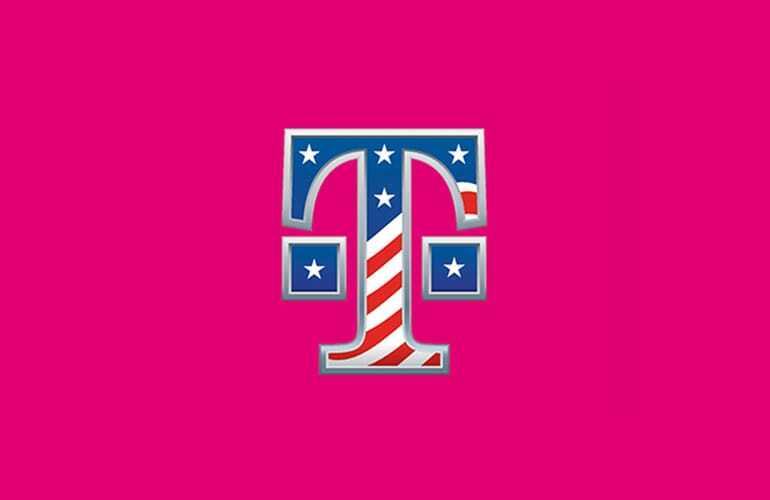 Bellevue, Washington — April 18, 2018 — T-Mobile (NASDAQ: TMUS) today unveiled an expansive, new companywide initiative to thank America’s military, veterans, and their families. First up, the Un-carrier introduced T-Mobile ONE Military – new plan for our nation’s military, their families and their small businesses. T-Mobile ONE Military includes everything in T-Mobile ONE – all at T-Mobile’s biggest discount ever for families with Half Off family lines. And, to keep the Half Off thank you going, military customers can get Half Off the most popular Samsung superphones – including the new Samsung Galaxy S9 and S9+ -- via bill credits through May 31. It all starts April 22 at T-Mobile stores nationwide or by calling 1-800-TMobile. And that’s just the first part of the Un-carrier’s multi-faceted military support initiative. T-Mobile is also making its biggest hiring commitment ever, pledging to recruit 10,000 veterans and military spouses in the next five years. And, the Un-carrier is joining forces with and funding non-profit FourBlock to expand their successful Career Readiness Program to 20 cities and launch it online so all military can take it from anywhere. Plus, the Un-carrier is investing more than $500 million this year to expand LTE coverage and capacity and lay the foundation for 5G in communities around US military bases. T-Mobile has long been recognized as a leader in military support. In 2017, the Un-carrier was named a Top 100 Military Friendly Employer by Military Friendly® for 11 years. On top of that, T-Mobile has been recognized with more than 20 additional military-friendly honors over the last decade, due in part to its hiring track record and benefits which include guaranteed pay and benefits for military leave, reserve training, and up to six months of deployment. But, for the Un-carrier, good is never good enough. T-Mobile ONE Military is the biggest military discount in wireless. Where the Duopoly give military $15 off per account or 15% off – roughly what they tack on to the bill in taxes and fees – the Un-carrier is going big. It’s 20% off the first line and Half Off up to five additional voice lines. The first line is $55 with AutoPay – normally $70. And it’s Half Off after that, up to six lines – just $25 for the second line and $10 per line for the third through sixth lines with AutoPay. Altogether, that’s a massive savings. On average, a family of four can save $665 compared to AT&T and $764 compared to Verizon per year with their military discounts. Plus, anyone on T-Mobile ONE Military can get a Samsung Galaxy S9, S9+ or S8 Active at Half Off, too! Simply snag your new phone on an Equipment Installment Plan (EIP) by May 31st and get your discount back via 24 monthly bill credits for up to three phones per account. T-Mobile ONE Military will be available at T-Mobile stores nationwide – and on bases – starting April 22 for military and their families, including active duty military, Reserve, National Guard, veterans, and Gold Star families, plus the small businesses they own up to 12 voice lines. That’s why T-Mobile is pledging to hire 10,000 veterans and military spouses in the next five years, expanding the Un-carrier’s prior 2016 commitment as part of the Joining Forces Initiative to hire 5,000 more of our nation’s veterans and their spouses by 2021. T-Mobile is providing funding and support to expand the FourBlock Career Readiness Program to 20 total cities and launch online this fall, so that ALL members of the US military, veterans and their families anywhere on the globe can enroll for free. FourBlock created the FourBlock Career Readiness Program in 2013, in partnership with Columbia University Center for Veteran Transition and Integration, to help military transition to civilian careers. To date, the program has delivered impressive results, helping more than a thousand alumni land fulfilling, long-term careers. 94% of alumni feel FourBlock improved their transition from military to corporate life. 80% say they were inspired to pursue more challenging careers, and 87% say FourBlock opened up new career paths. You can visit www.FourBlock.org to learn more and to sign-up to be notified when the FourBlock Career Readiness Program launches online nationwide this fall. T-Mobile’s nationwide LTE coverage has nearly tripled in the last three years and now covers 322 million people – nearly every American – serving our military well. And, Un-carrier customers get it all on a network with download speeds that are 16% faster than Verizon and 18% faster than AT&T on the Samsung Galaxy S9 and S9+ since launch, according to Speedtest.4 Plus, T-Mobile is the sole provider of LTE coverage at Naval Base Guantanamo Bay, thanks to the Un-carrier’s groundbreaking deal with the Navy to build a network from the ground up connecting the men, women and families stationed there to those back home. T-Mobile is putting its biggest network investment ever – more than $8 billion in nationwide spectrum – to work for our military and the communities they call home. In 2018, T-Mobile will invest more than half a billion dollars to expand LTE capacity and coverage around military bases and the communities they call home. And, the Un-carrier is laying a foundation for 5G in those communities by rolling out 5G-ready infrastructure. When this breakthrough, next-generation technology is ready, our military won’t be left behind because T-Mobile is planning to bring nationwide 5G to everyone, everywhere. To learn more about T-Mobile’s network visit www.t-mobile.com/coverage. To learn more about T-Mobile’s military support initiative and T-Mobile ONE Military, visit www.t-mobile.com/brand/military. 1 Department of Veterans Affairs, 2015 Veteran Economic Opportunity Report, (January 2015). According to the analysis, nearly 53 percent of veterans experience an unemployment spell within 15 months of separating from the military. 2 Military Officers Association of America, Military Spouse Unemployment Rate at Least Four Times Higher Than National Average, (October 2017). 3 U.S. Chamber of Commerce, Military Spouse in the Workplace: Understanding the Impacts of Spouse Unemployment on Military Recruitment, Retention, and Readiness, (June 2017). 4 LTE average download speeds based on Ookla's analysis of Samsung Galaxy S9 and S9+ Speedtest Intelligence Data for 1Q 2018. On all T-Mobile plans, during congestion, the small fraction of customers using >50GB/month may notice reduced speeds until next bill cycle due to prioritization. Video streams at 480p. Limited time offers; subject to change. T-Mobile ONE Military: Submit military identification within 45 days at t-mobile.com/military/verification; otherwise your plan will become T-Mobile ONE at an additional cost of up to $20/line per month. Military individual must be account holder & account must maintain valid military line. Credit approval, deposit, and $25 SIM starter kit or $20 upgrade support charge may be required. Not combinable with other plans, discounts, or features; existing customers who switch may lose certain benefits. Without AutoPay, $5 more/line. Biggest discount ever for military families ineligible for T-Mobile ONE 55+ (which doesn’t include Netflix a $10.99 value). Samsung 50% Off: Submit military I.D. w/in 45 days at t-mobile.com/military/verification and remain active & in good standing on military plan to receive bill credits.? If you cancel wireless service, remaining balance on your smartphone may become due; contact us for details. Qualifying credit, plan, & finance agreement required. Tax on pre-credit price due at sale. Allow 2 bill cycles. Max 3/account. May not be combined with some offers or discounts.